Growing increasingly outdated with the advent of sleeker, more powerful starfighters, the Y-wing nonetheless has a proud track record of service in the Rebel Alliance. The sturdy fighter-bomber gets its name from its shape: a reinforced central spar connects the cockpit to a cross-spar. At each end of the cross-spar rests a powerful engine nacelle, which houses the fighter's sublight and hyperdrive engines. Just aft of the cockpit module is the astromech droid socket. The Y-wing's primary weapons are twin forward-firing laser cannons, housed in a recessed slot in the front of the cockpit module. A secondary weapon is a turret-mounted paired set of cannons. Though many Y-wings fly as single-pilot fighters, some sport a two-seat configuration with a rear-facing tailgunner operating the turret cannons. The Y-wing also carries proton torpedo launchers. During the Battles of Yavin and Endor, Y-wing squadrons were influential in helping defeat the Death Star threats. A Y-wing brandishes its squadron colors and markings on its main cockpit module and the forward tips of the engine nacelles. Star Wars has been a boon for model companies since moviegoers John William’s score first echoed thru the movie theatres. Some 30 years (damn!) later, Fine Molds decided to add a 1/72 scale Y-Wing into its amazing catalog of Star Wars Models. Being a Star Wars geek but not that big of a geek as I do not wear Imperial Stormtrooper armor as casual wear and no longer own any Star Wars figures—mine were given away by my mom in 1984 (Thanks Mom! )—I jumped to order one when they became available (in July 2007.) Like the rest of the kits, Fine Mold used the actual studio models to recreate the Y-Wing in 1/72 scale. I was amazed when I opened up the kit. 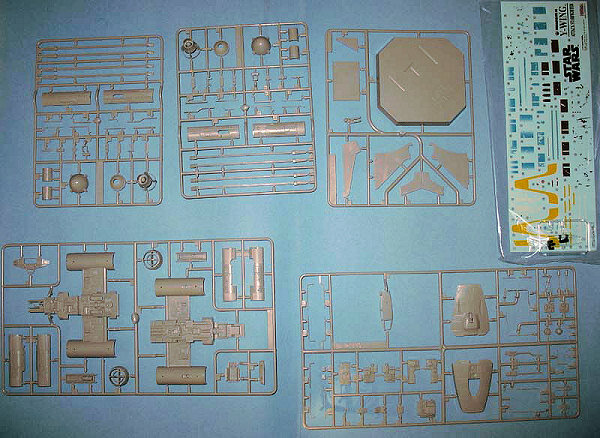 It consists of 130 parts (2 clear) of very well molded light grey styrene. The detail is very fine and crisp with a little flash on a couple of the parts. This kit is another winner from Fine Molds and sure to be a fun easy build. It is a bit pricier than the average 1/72 kit, but one should factor in the Lucas “premium” and the fact that these kits are very well engineered and if you are a Star Wars fan. Kit courtesy of my own wallet.